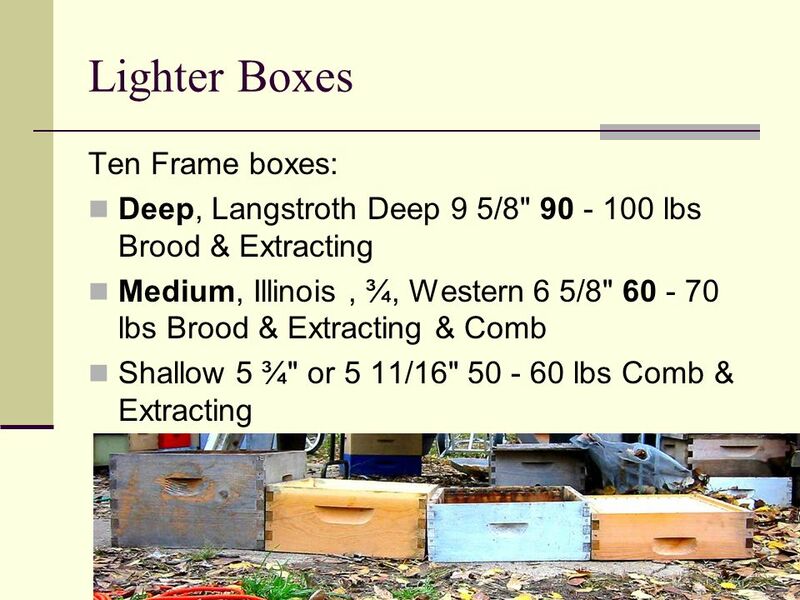 Deep, Langstroth Deep 9 5/8" lbs Brood & Extracting Medium, Illinois, ¾, Western 6 5/8" lbs Brood & Extracting & Comb Shallow 5 ¾" or 5 11/16" lbs Comb and Extracting If you want a grasp of these and don't have a hive yet, go to the hardware store and stack up two fifty pound boxes of nails or, at the feed store, two fifty pound bags of feed. 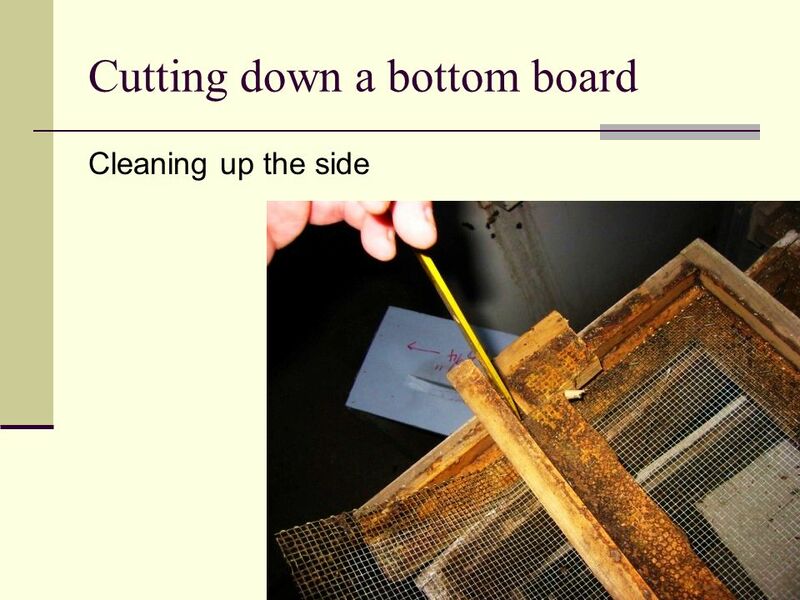 This is approximately the weight of a full deep. 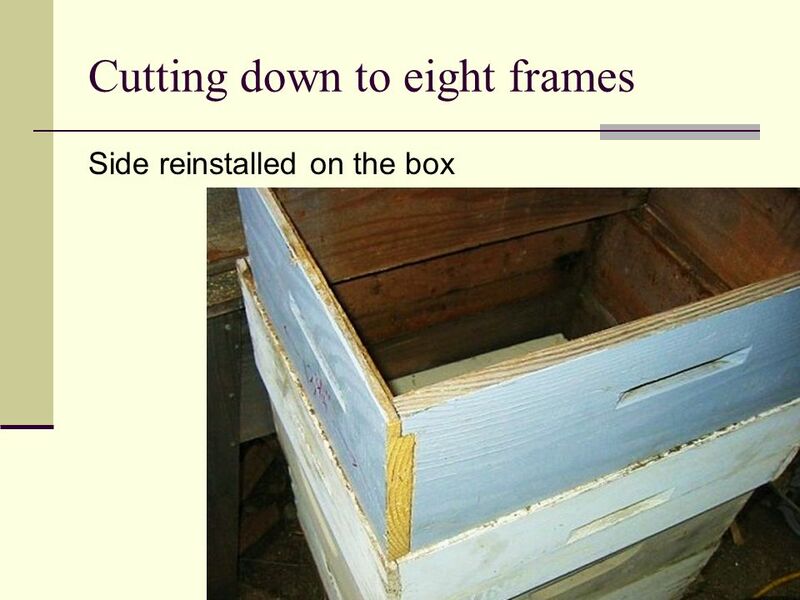 Now take one off and lift one box. 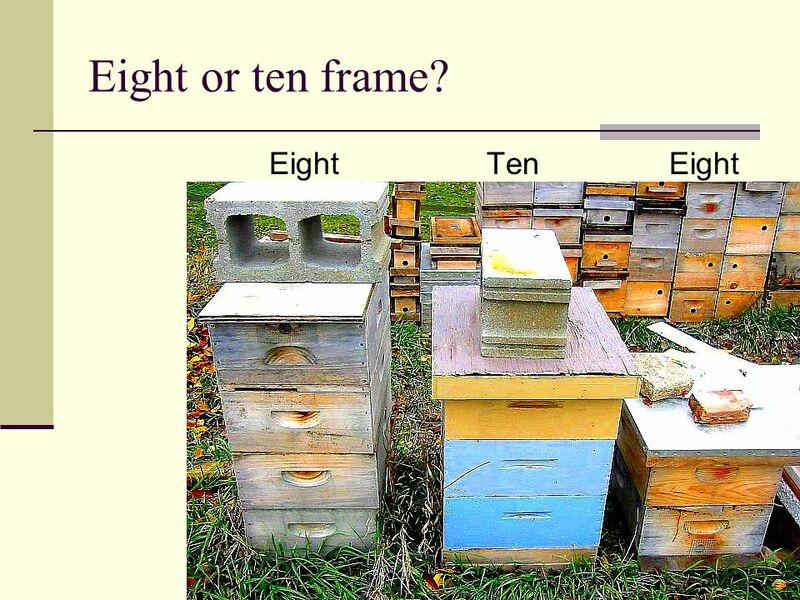 This is approximately the weight of a full eight frame medium. 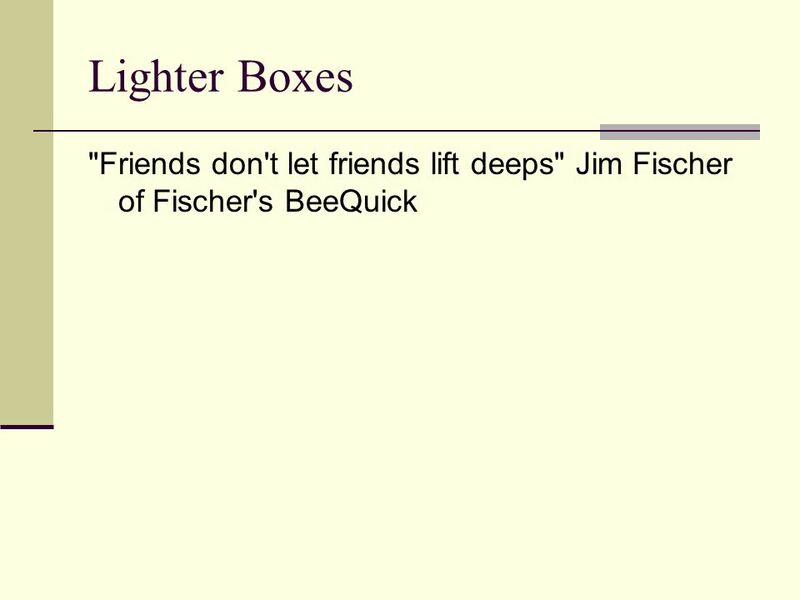 I find I can lift about fifty pounds pretty well, but more is usually a strain that leaves me hurting the next few days. 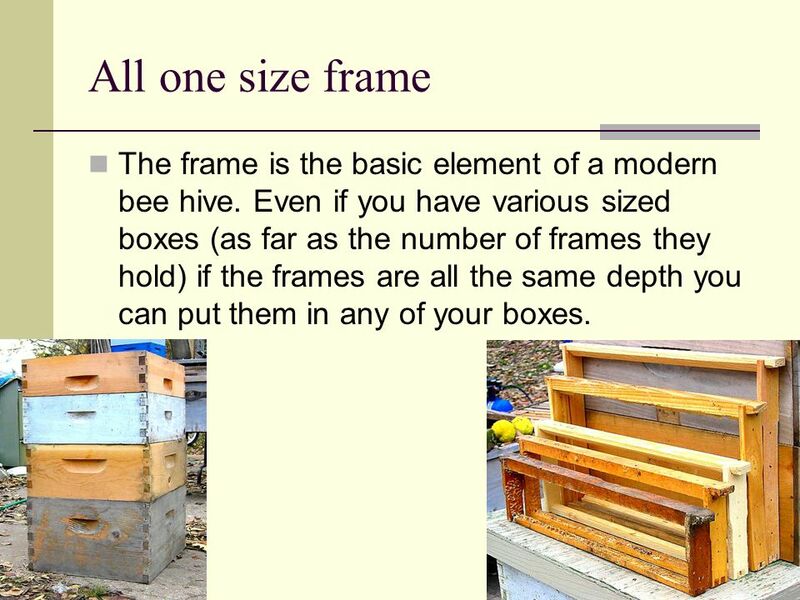 The most versatile size frame is a medium and a box of them that weighs about 50 pounds is an eight frame. So, first I converted all my deeps into mediums. 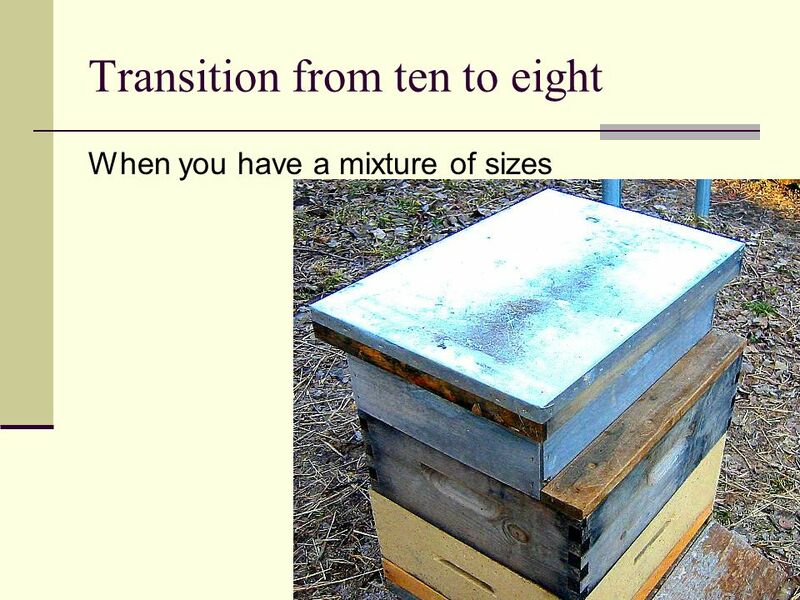 It was a huge improvement over the occasional deep full of honey I had to lift. 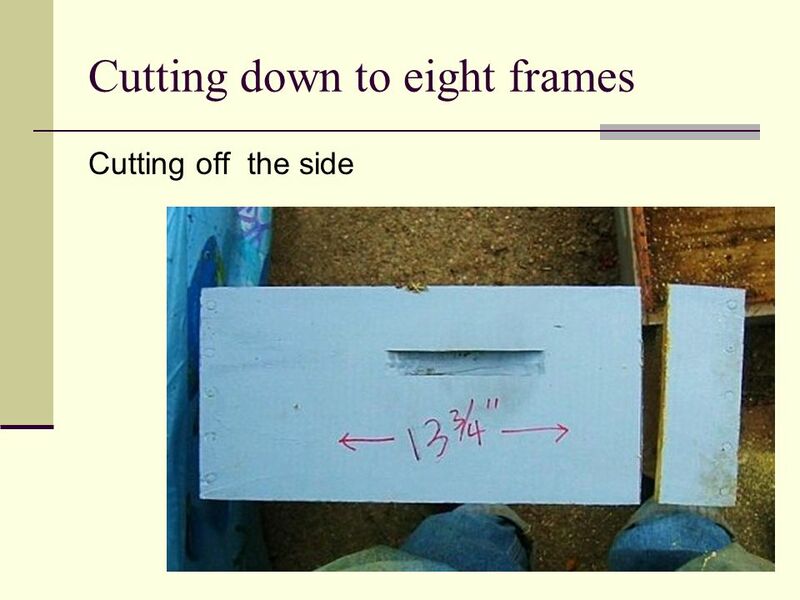 I still got tired of lifting 60 pound boxes, so I cut the ten frame mediums down to eight frame mediums. I'm really liking them. 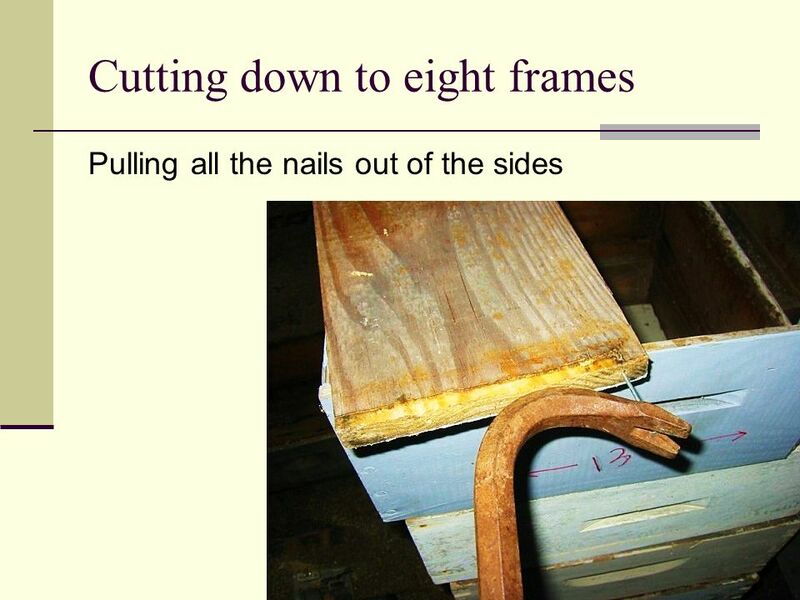 They are a comfortable weight to lift all day long and not be in pain for the next week. 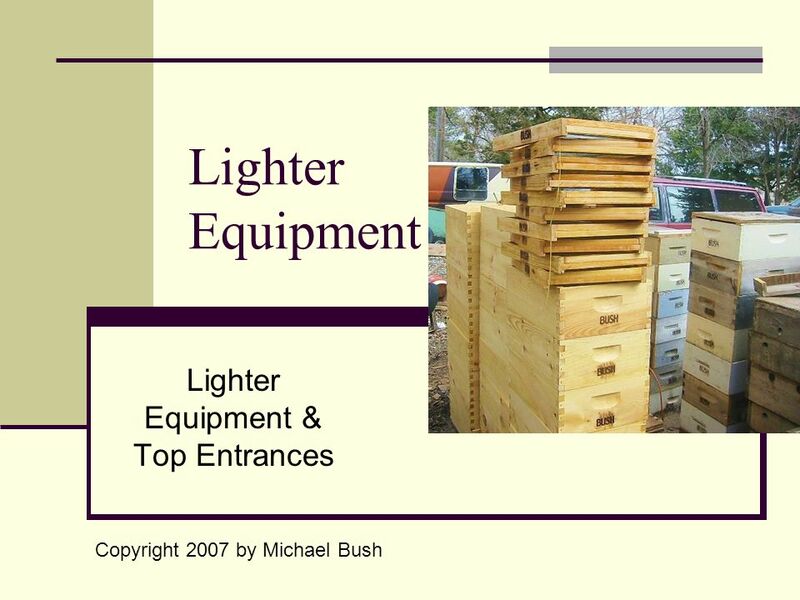 Any lighter and I might be tempted to try to lift two. 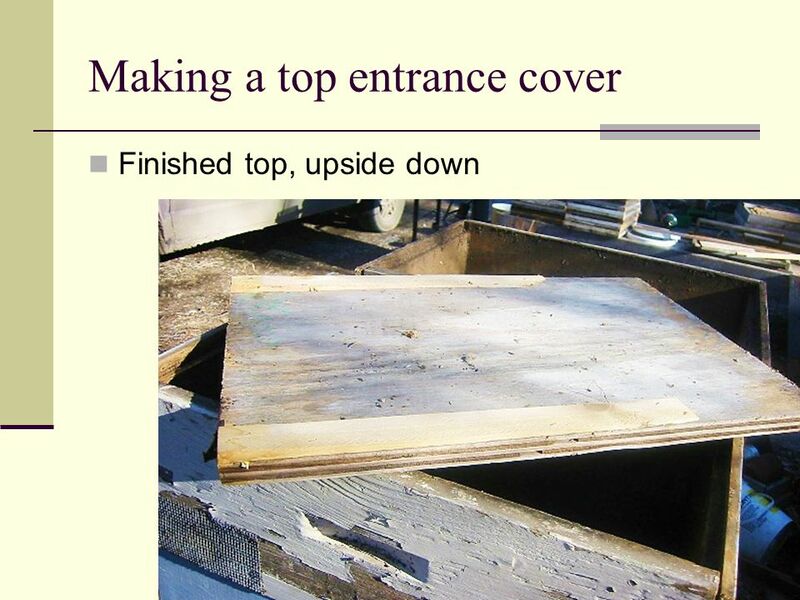 Any heavier and I'm wishing it was a shade lighter. 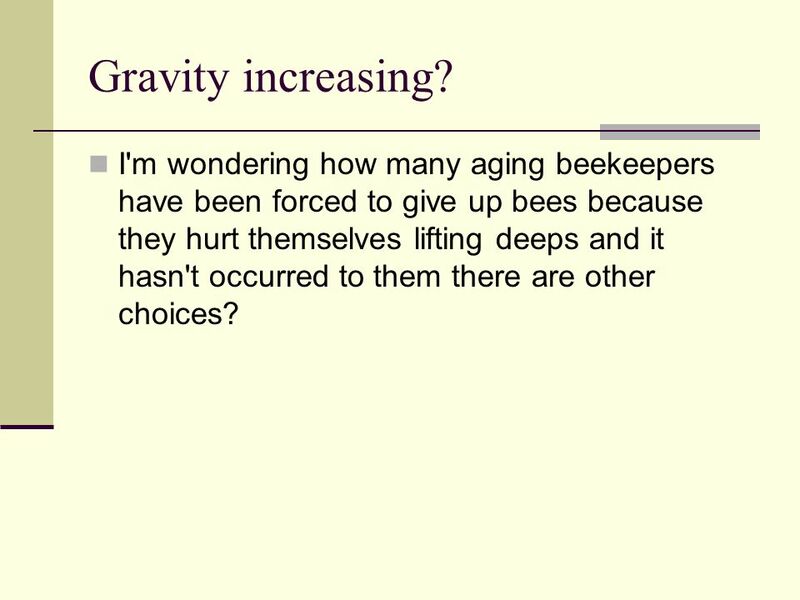 5 Gravity increasing? 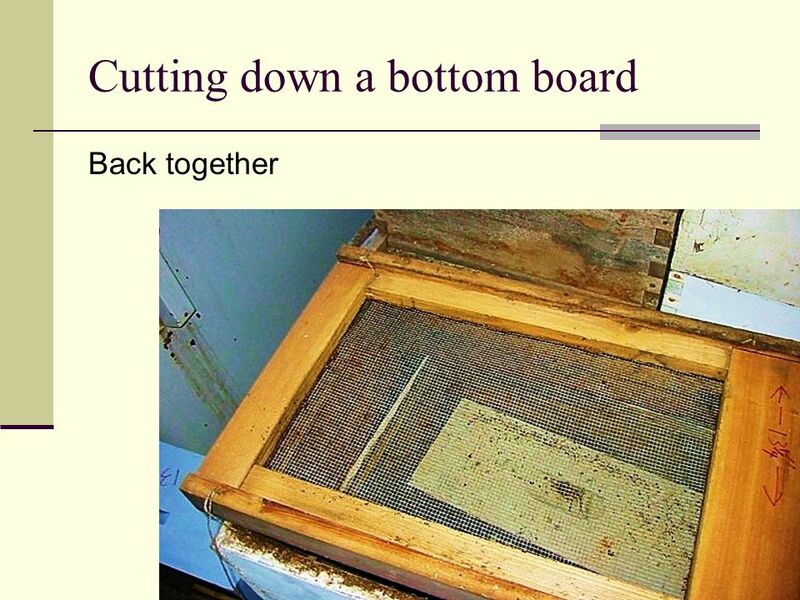 I'm wondering how many aging beekeepers have been forced to give up bees because they hurt themselves lifting deeps and it hasn't occurred to them there are other choices? 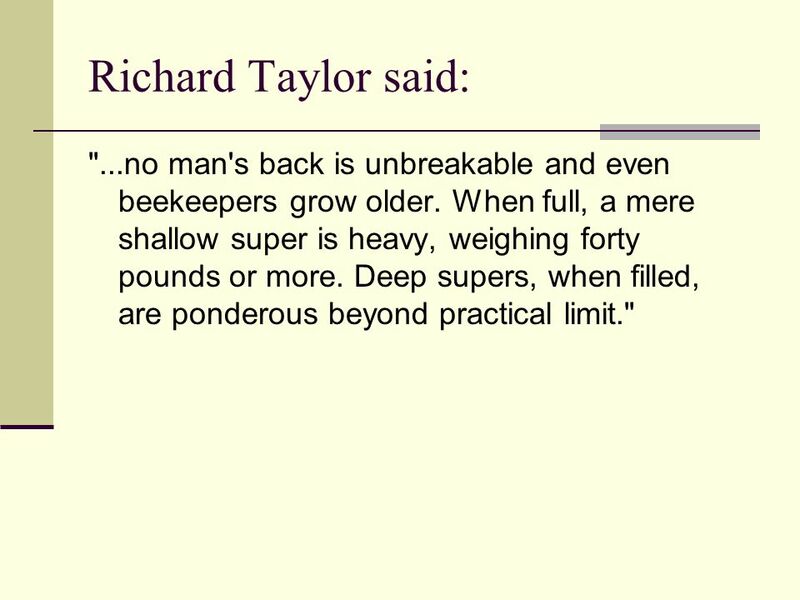 6 Richard Taylor said: "...no man's back is unbreakable and even beekeepers grow older. 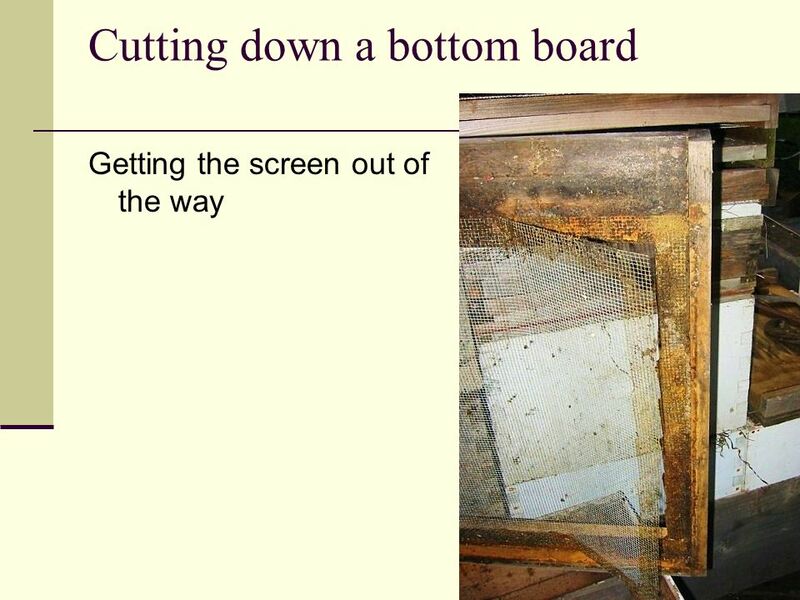 When full, a mere shallow super is heavy, weighing forty pounds or more. 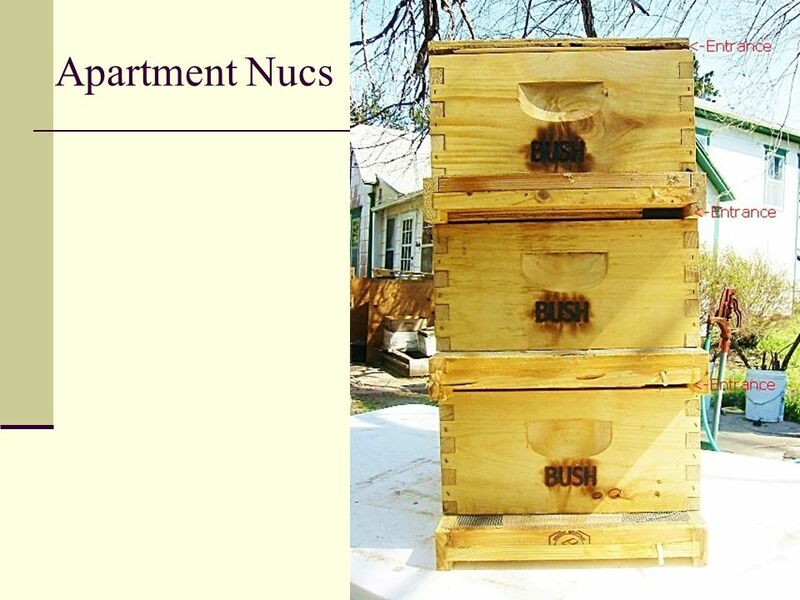 Deep supers, when filled, are ponderous beyond practical limit." 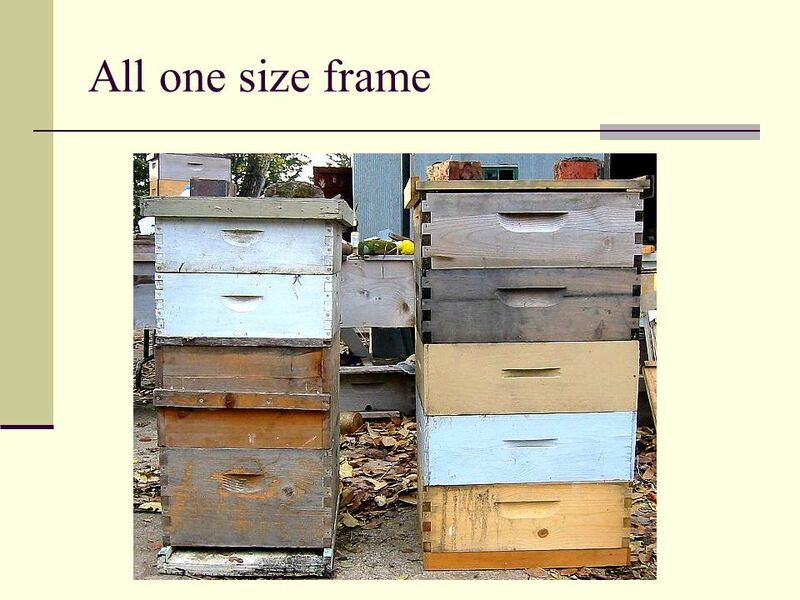 8 All one size frame The frame is the basic element of a modern bee hive. 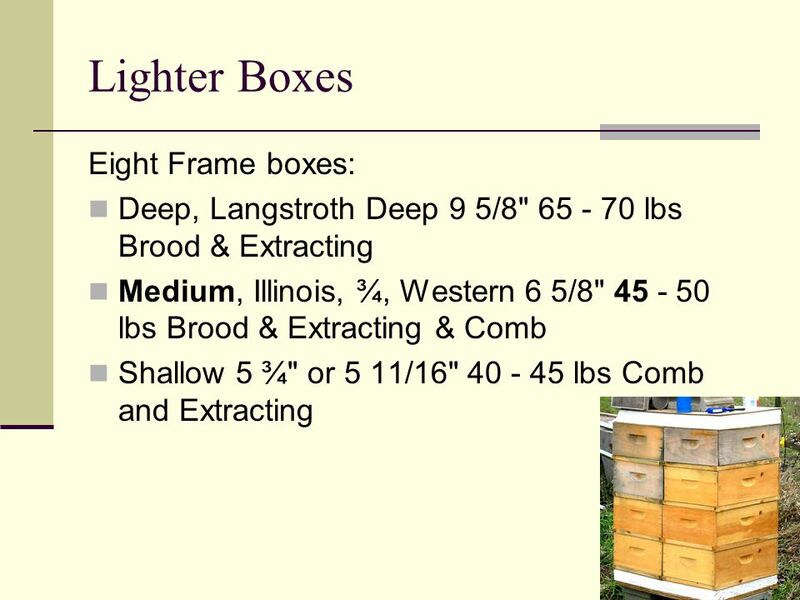 Even if you have various sized boxes (as far as the number of frames they hold) if the frames are all the same depth you can put them in any of your boxes. 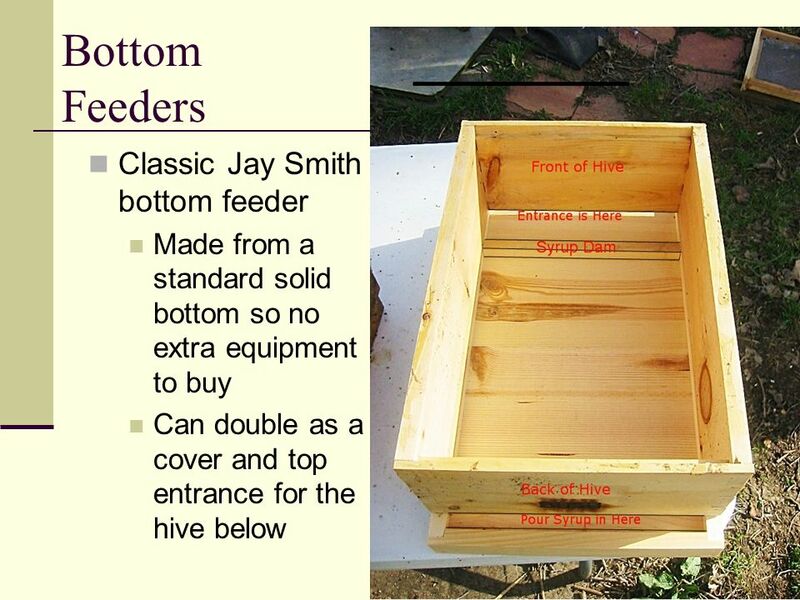 You can: Put brood up a box to "bait" the bees up. 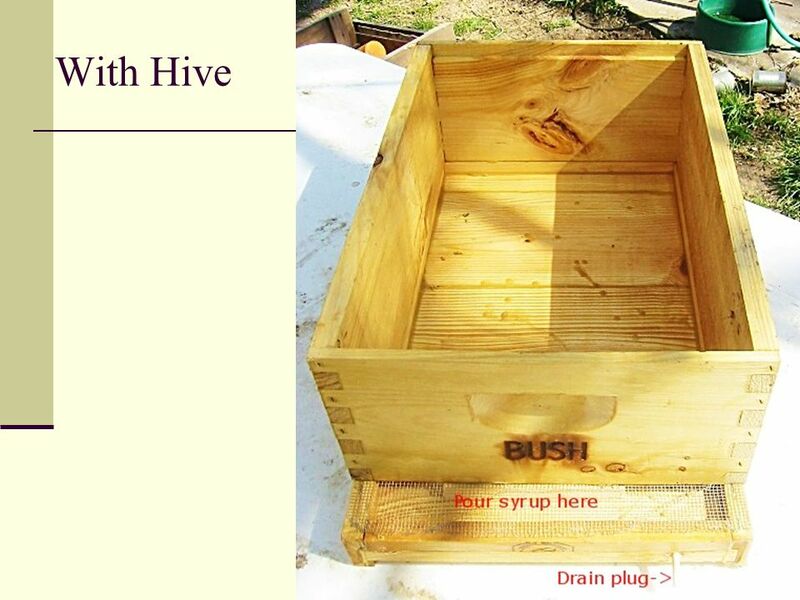 Put honey combs in for food wherever you need it. 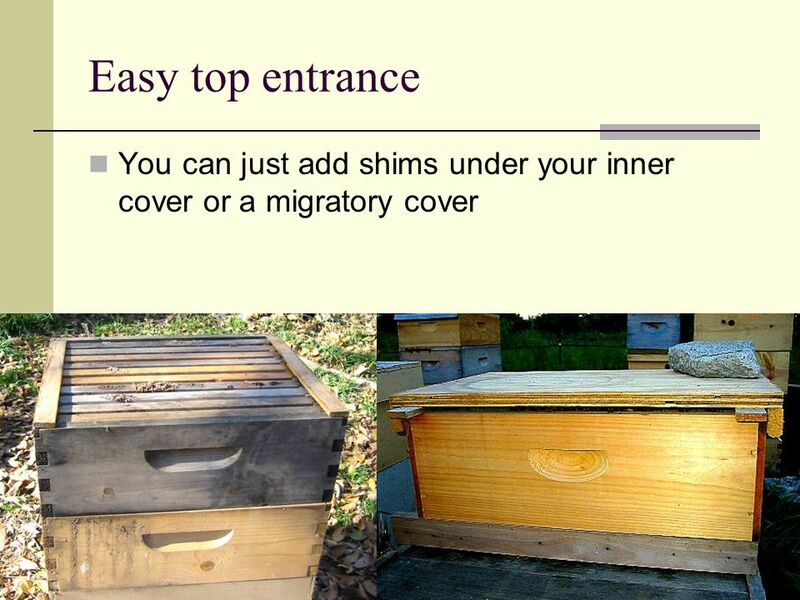 Unclog a brood nest by moving pollen or honey up a box or even a few frames of brood up a box to make room in the brood nest to prevent swarming. 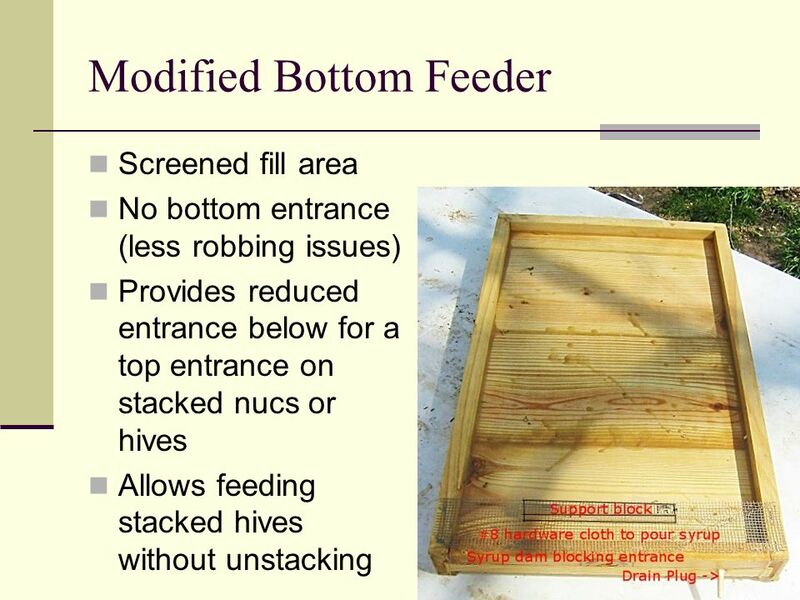 Run an unlimited brood nest with no excluder and if there is brood anywhere you can move it anywhere else. 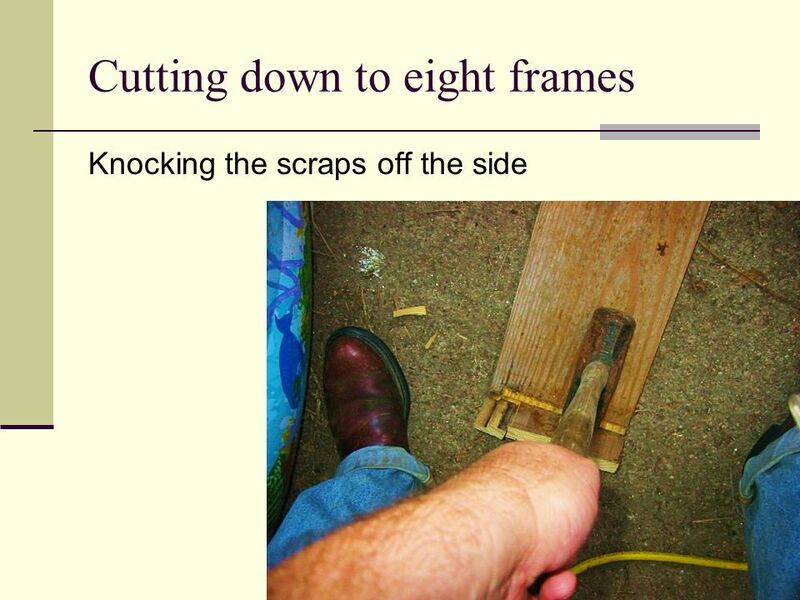 I cut all my boxes and frames down to mediums. 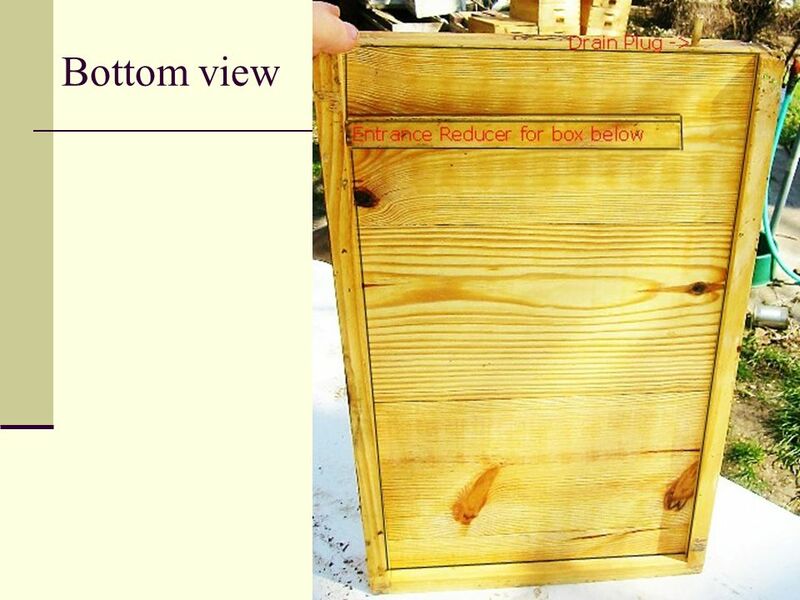 The boxes, are easy. 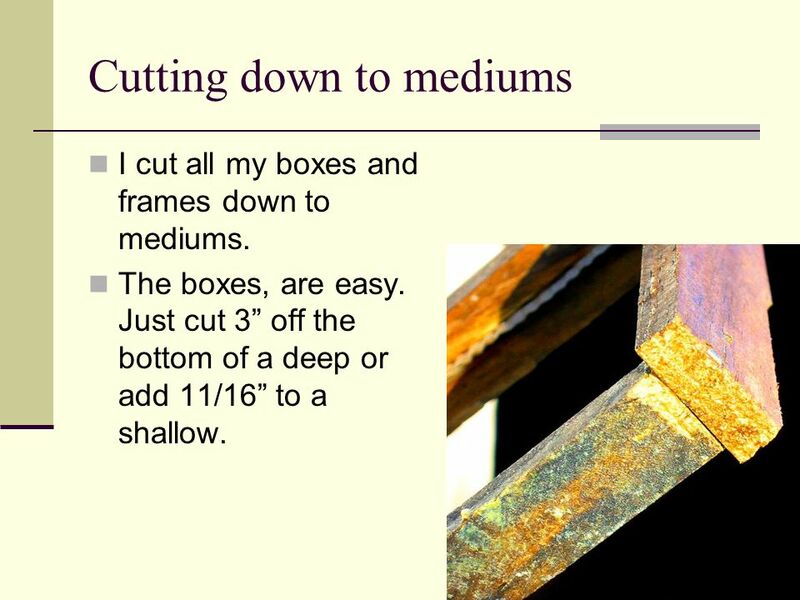 Just cut 3” off the bottom of a deep or add 11/16” to a shallow. 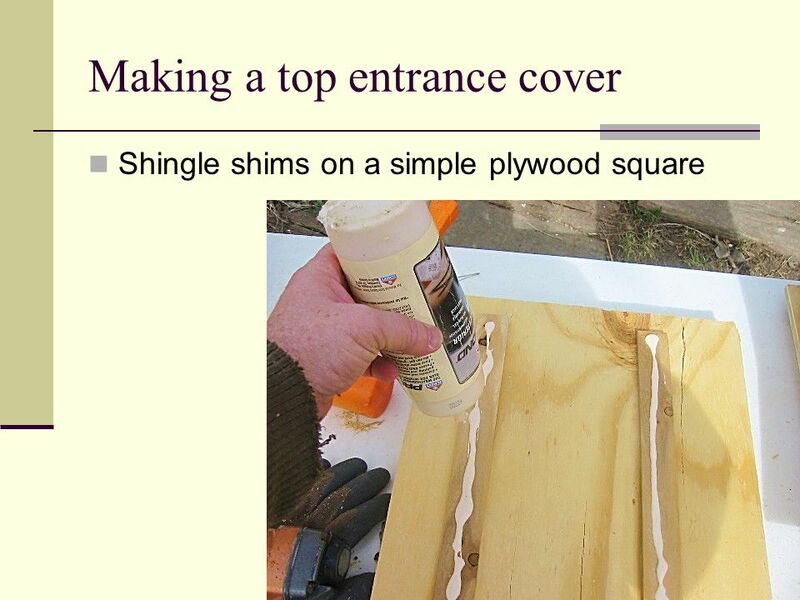 Set a table saw fence to 6 ¼”. 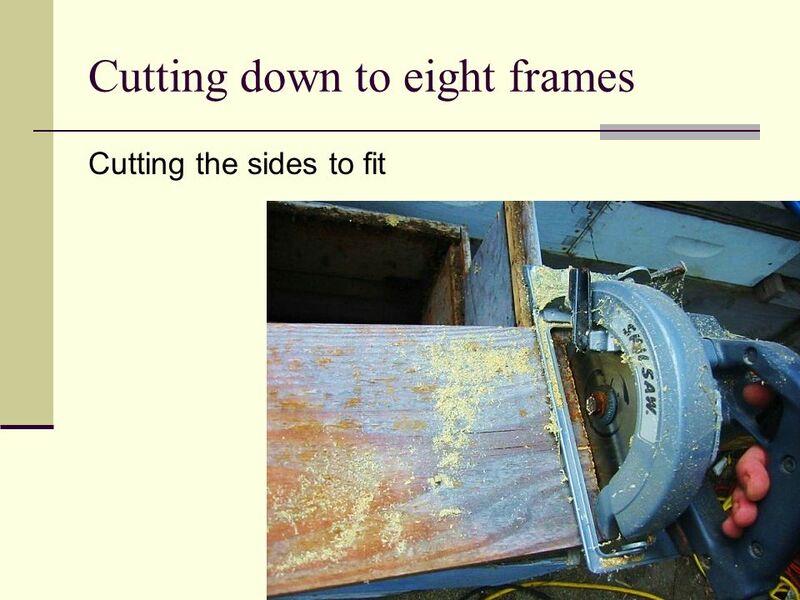 Run the frames through the table saw to cut off the bottom. 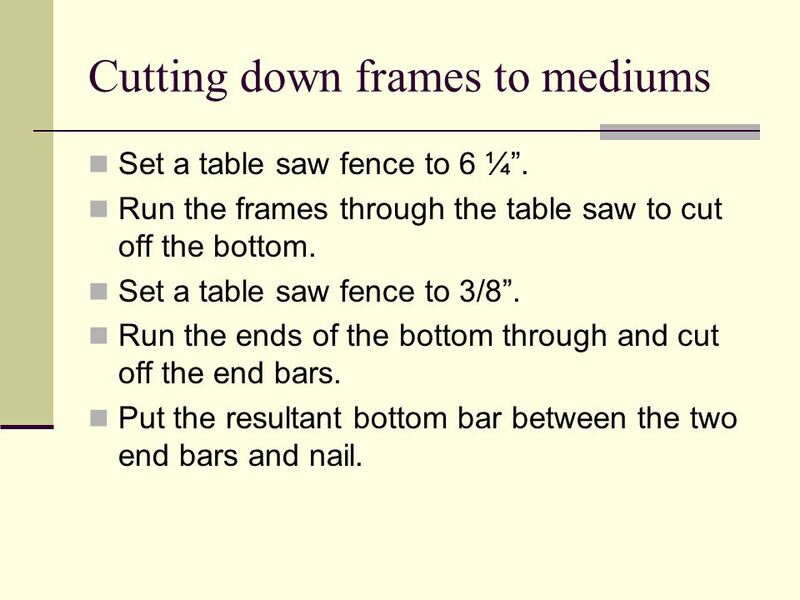 Set a table saw fence to 3/8”. 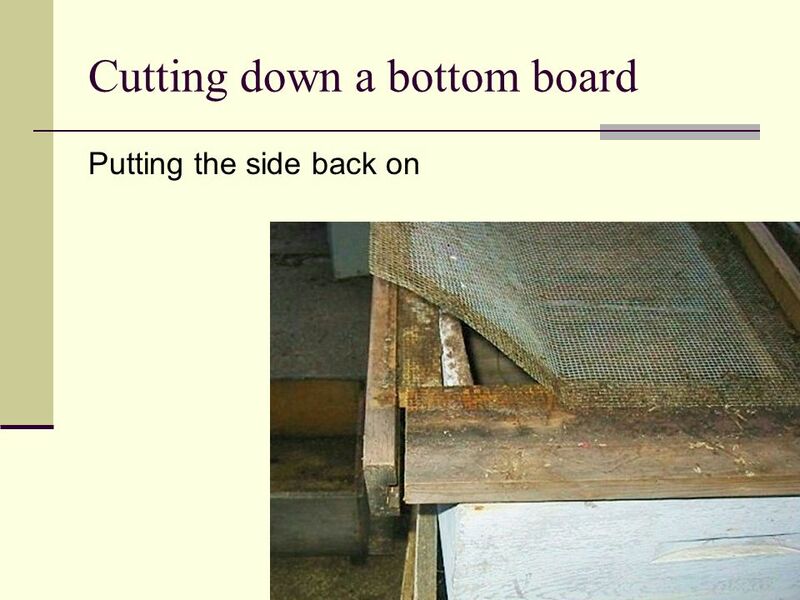 Run the ends of the bottom through and cut off the end bars. 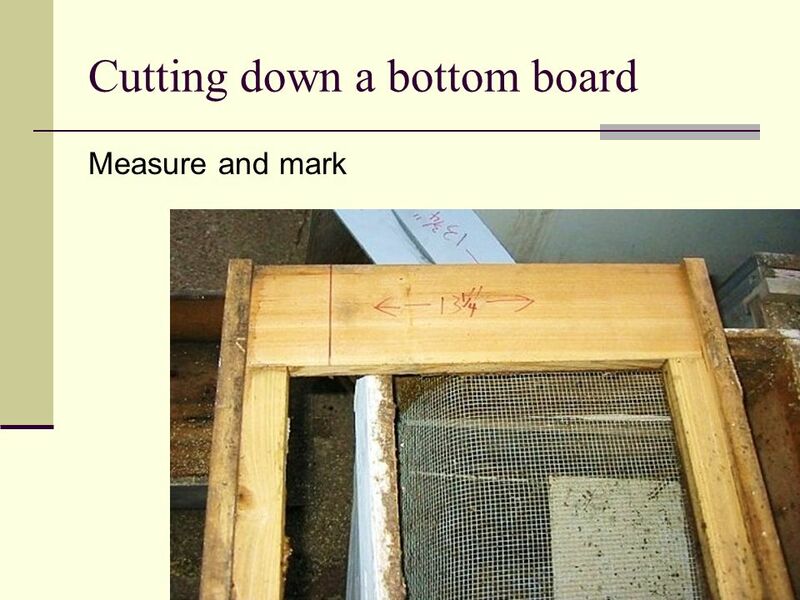 Put the resultant bottom bar between the two end bars and nail. 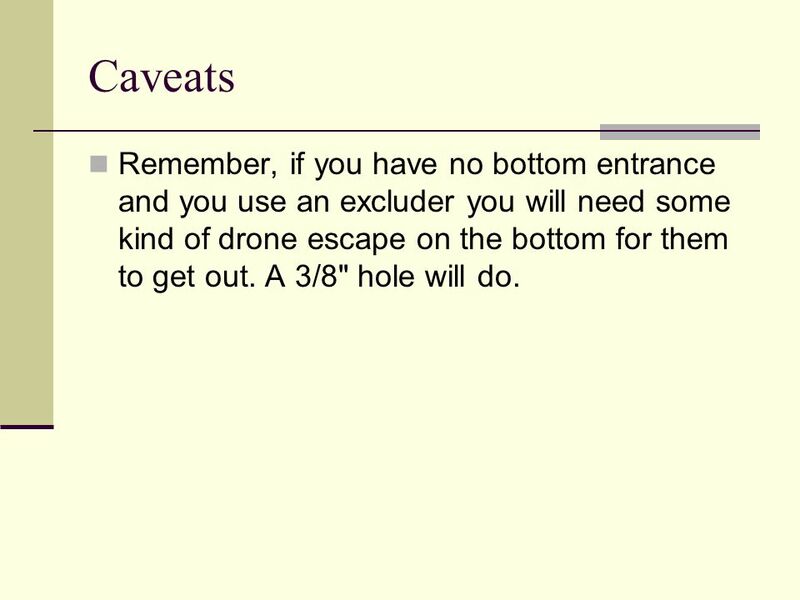 36 Caveats Remember, if you have no bottom entrance and you use an excluder you will need some kind of drone escape on the bottom for them to get out. 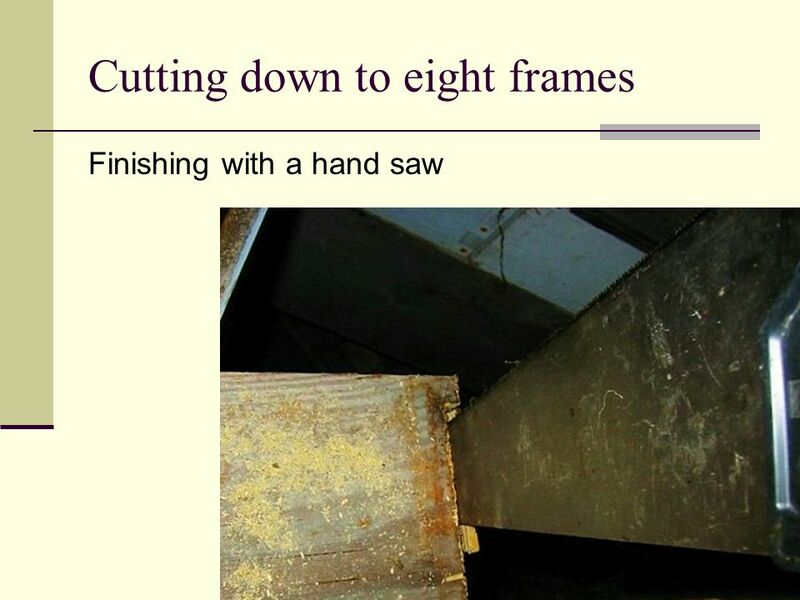 A 3/8" hole will do. 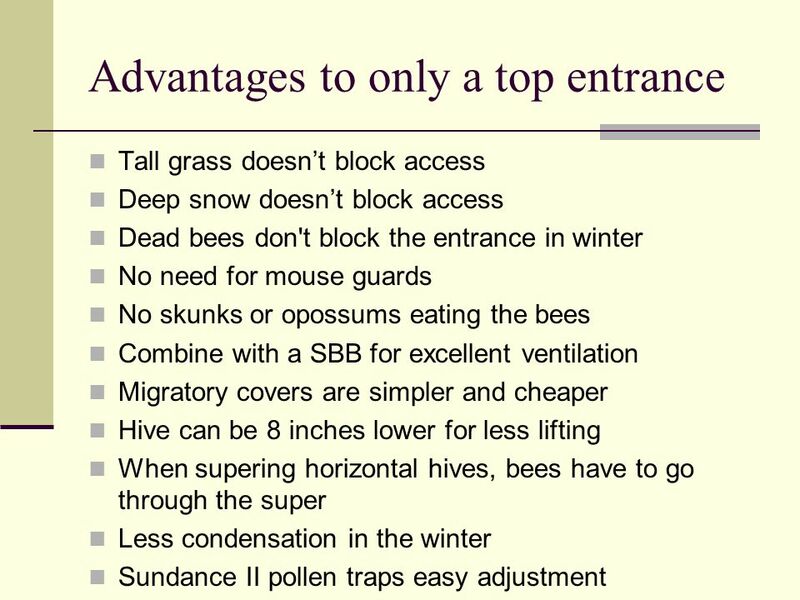 Download ppt "Lighter Equipment & Top Entrances"
The Whole Bee Concept Maintaining genetic diversity and locally adapted bees Copyright 2012 by Michael Bush. 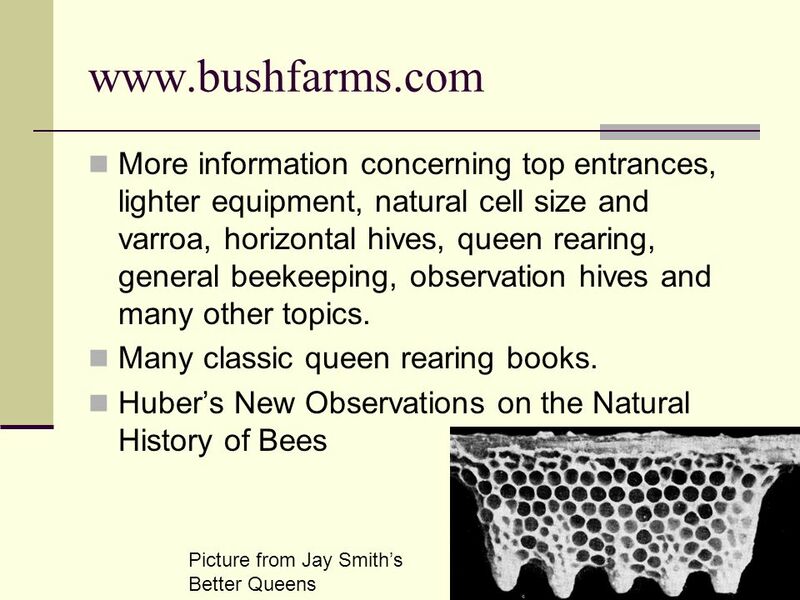 Observation Hives A window on the bees Copyright 2007 by Michael Bush. 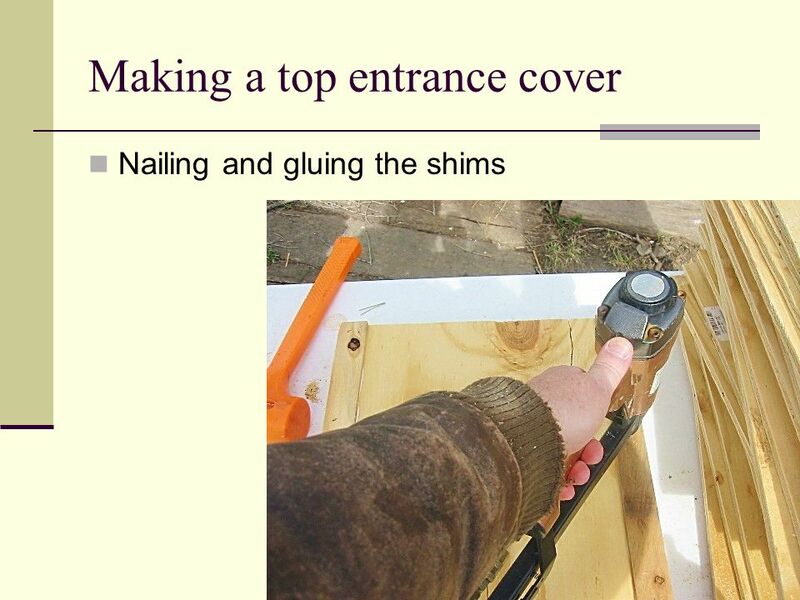 Alternative Equipment Why alternative equipment? 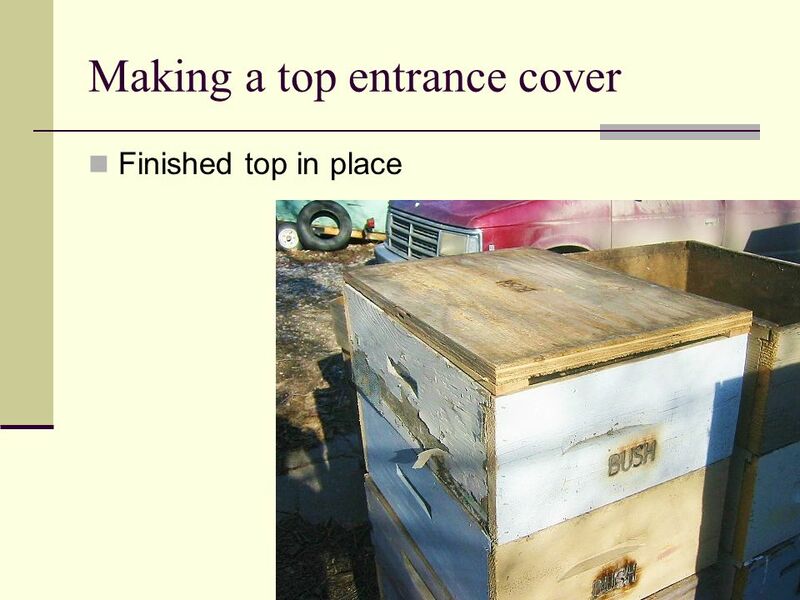 By Michael Bush Copyright 2005. 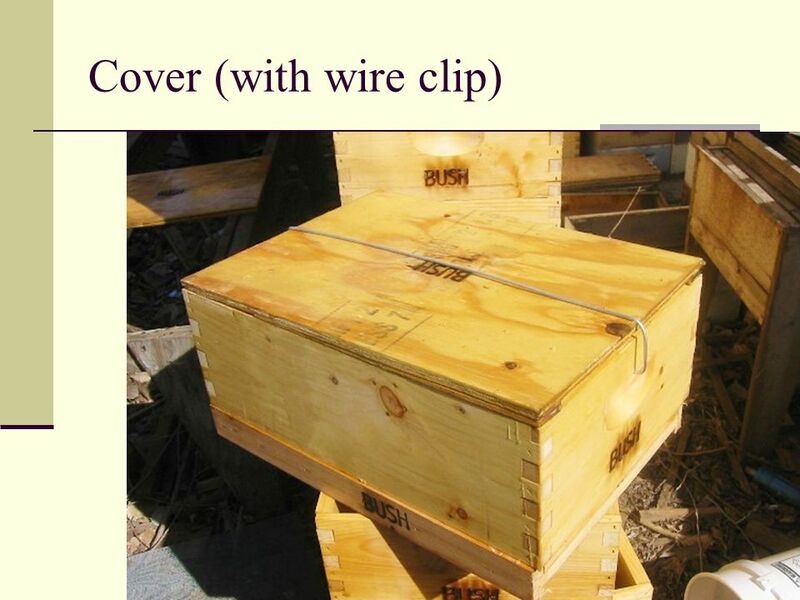 How To Catch A Swarm Using Buckets. 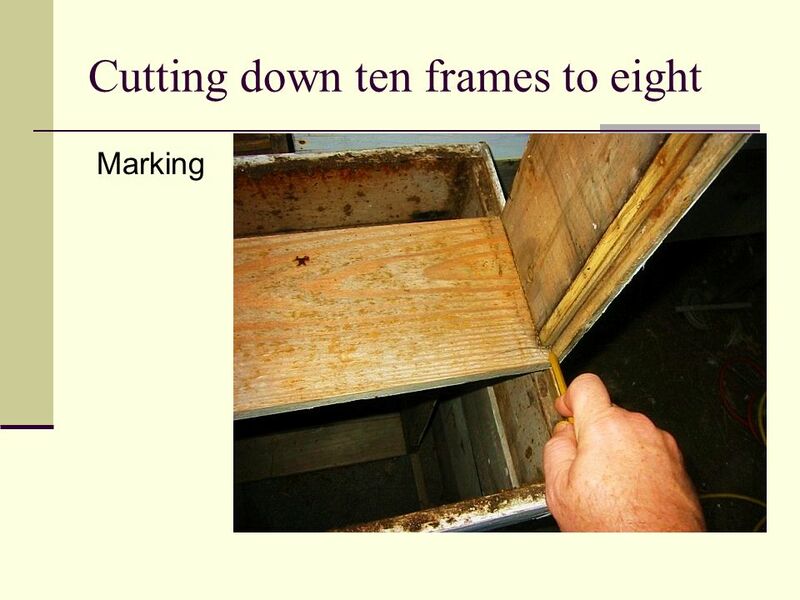 Take 2 plastic buckets and cut a large matching hole in the bottom of each. 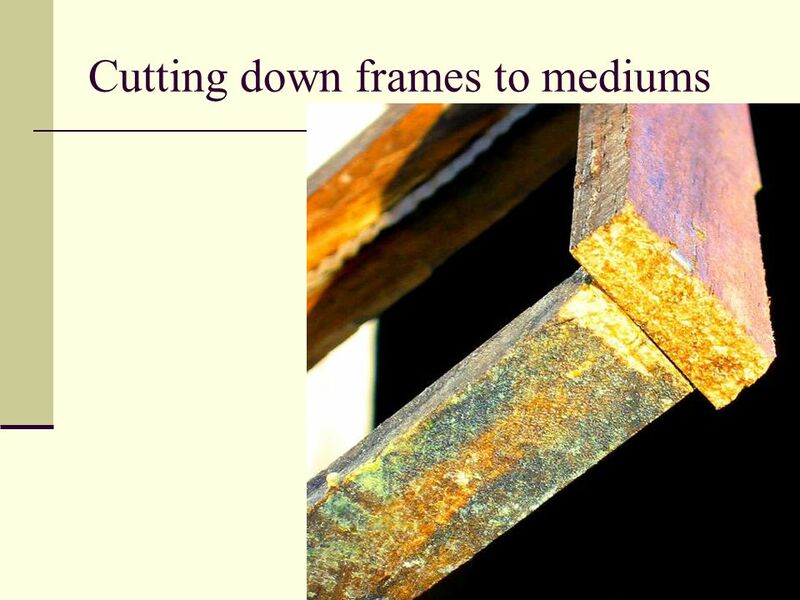 Using screen wire, preferably 1/8 hardware. 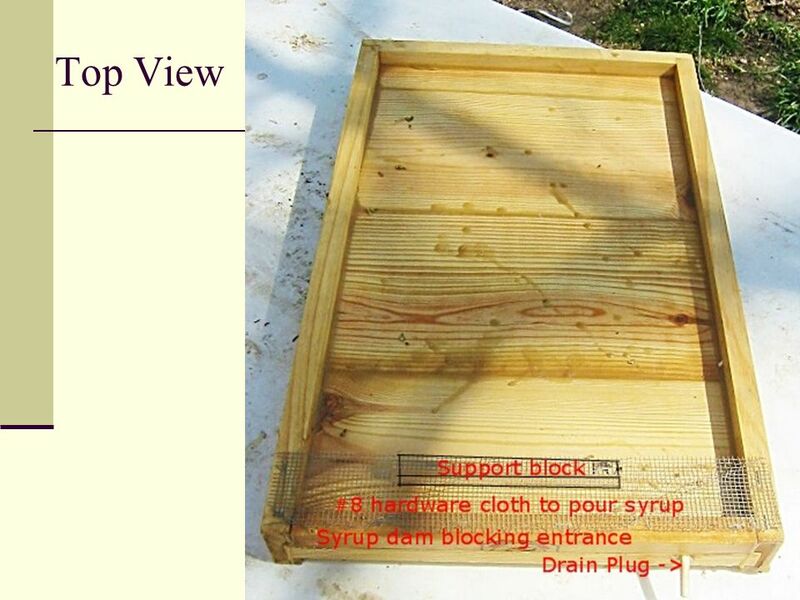 Summer Management and Honey Production. 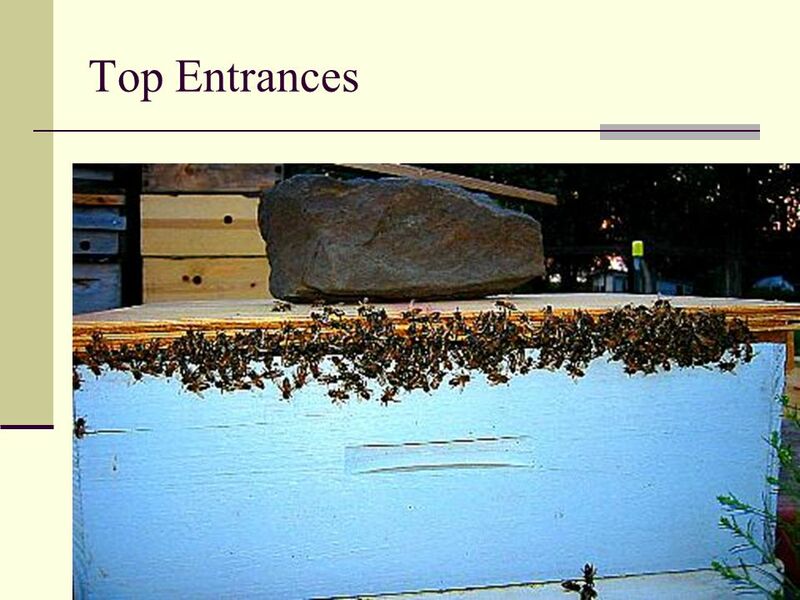 Summer Management Many commercial beekeepers are working hard to get their bees ready for pollination. 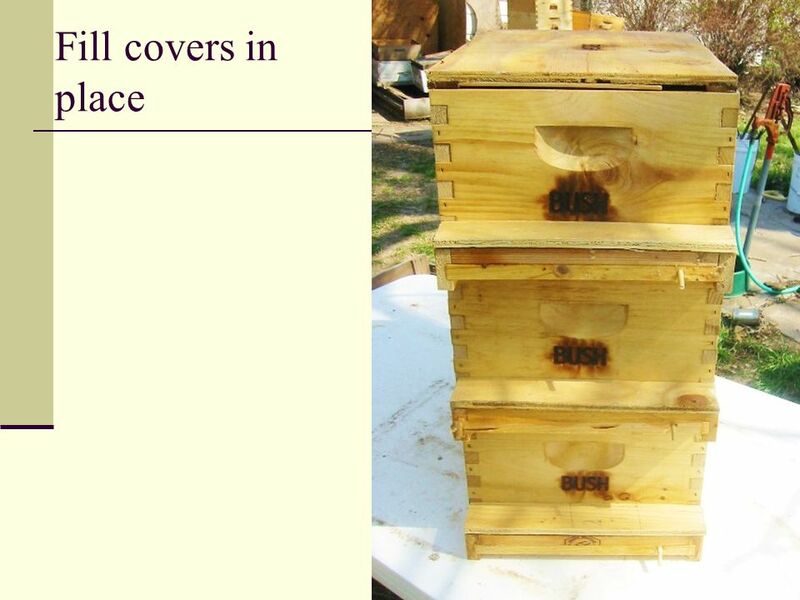 Beginning Beekeeping Week Two – Starting Out with a Hive. 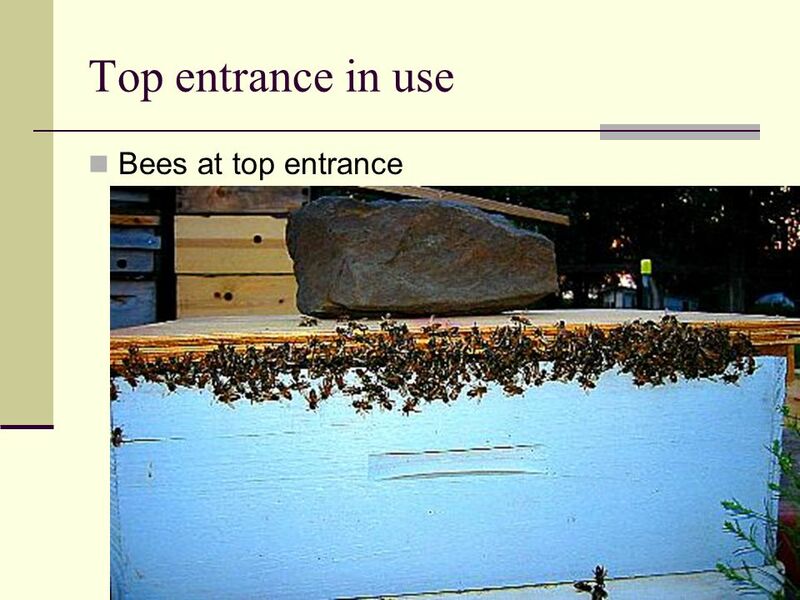 HONEY BEE Spring Management. 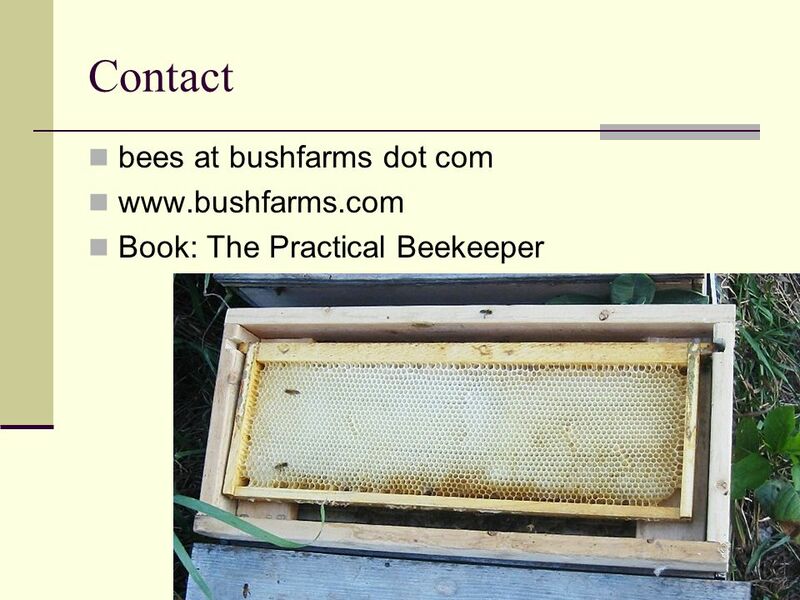 Spring Management  One of the most important things you will do to determine if you have a honey crop or …… not !